This is not de’ja-vu. 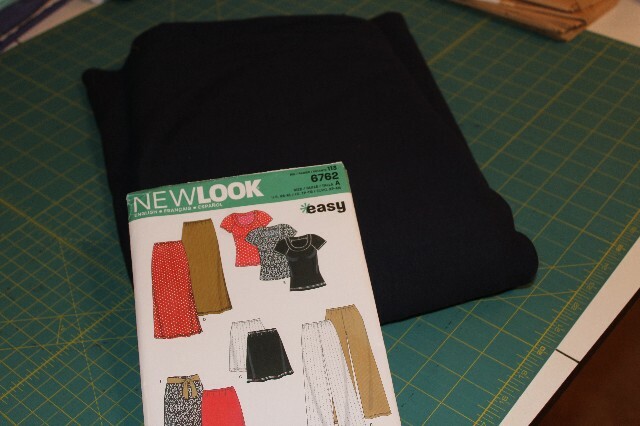 I’m posting about New Look 6762 again, but View E this time for the top. See, I left my favorite navy blue top at the coast and wanted to wear it to work tomorrow. 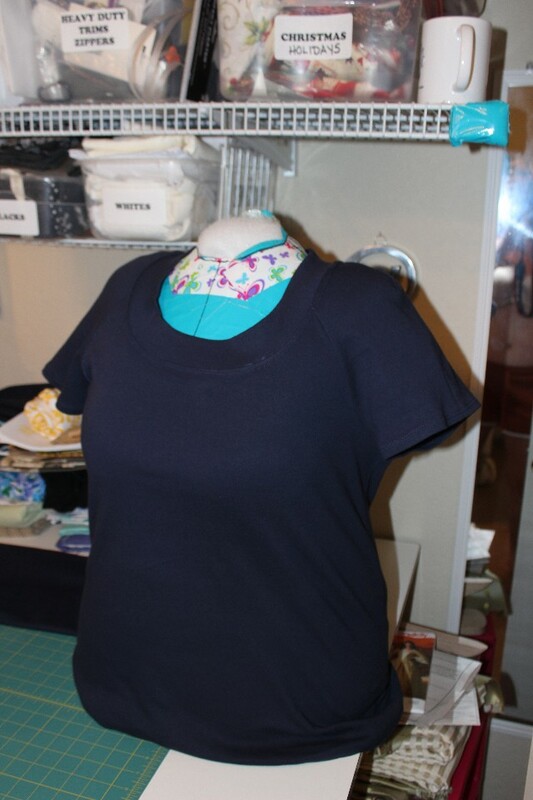 I had some fabulous navy blue jersey I got at Hancock Fabrics a few weeks ago in my stash, so I made myself a new top this morning. (Seriously, how cool is that?!) 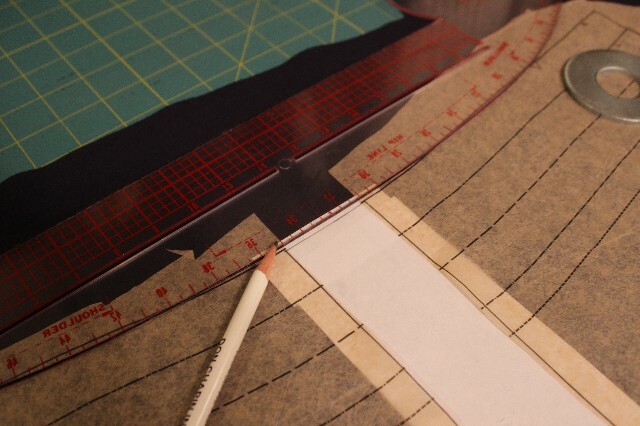 As always, I dry iron the pattern pieces flat so the cutting lines measure as close to the designer’s original as possible. 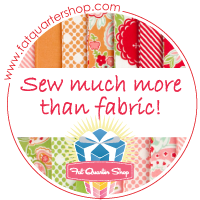 I held up the pattern to myself and decided that I’d add 1-3/4″ to the length. I’m tall and high waisted so I like a bit of length in my tops. 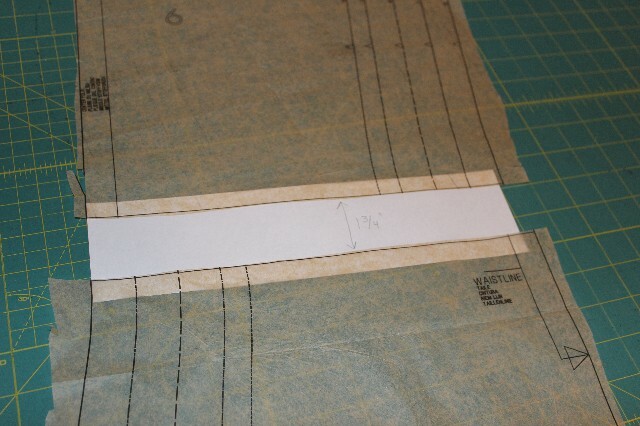 I cut the front and back pattern pieces on the lengthen/shorten line and then measured out a couple of extra paper pieces to add the additional length. When adding length, I don’t get all obsessive about cutting exactly on the lengthen/shorten lines but instead make sure that the printed line matches up with my drawn line on the paper. If needed, I true-up the new cutting line with my designer’s curve. I’m loving my new hardware-store-washer pattern weights! 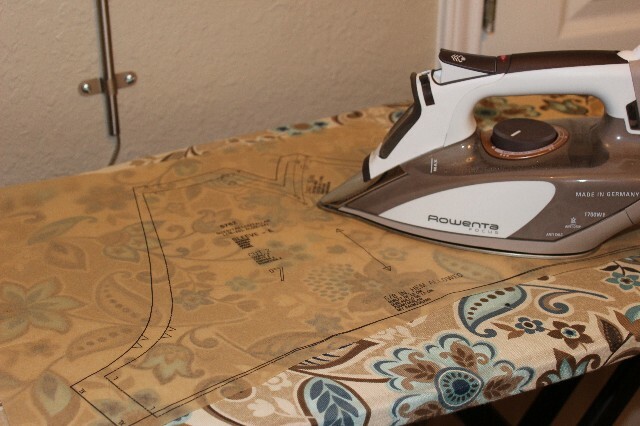 I prefer to cut my fabric, especially knits, with a rotary cutter. 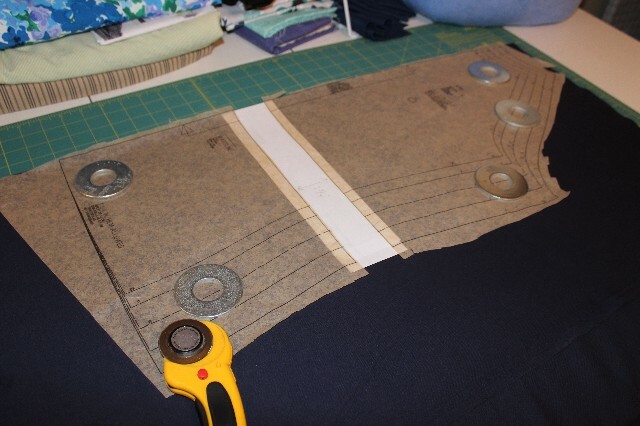 Some seamstresses freak out about a rotary cutter, but to me they are so much more accurate. 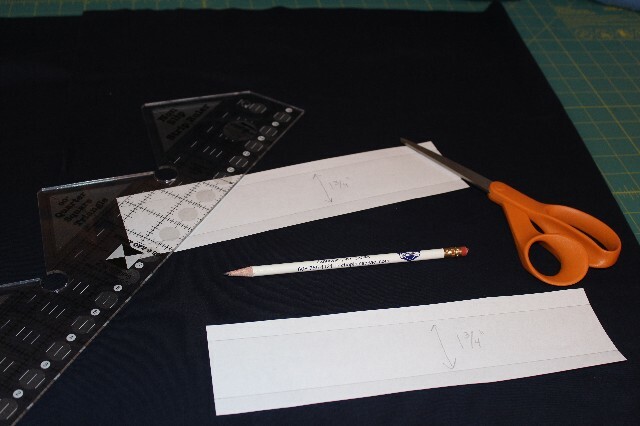 Sometimes with scissors, I get that jagged edge where the scissors were repositioned and I’m not comfortable with having to lift the fabric off the table to cut it. Rotary cutting prevents that completely. 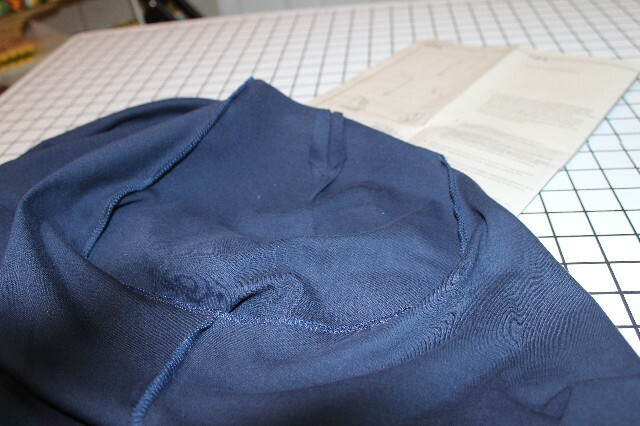 This was the first time I’d ever sewn a raglan sleeve. It was kind of weird going in because the top of the sleeve blends in with the neckline vs. the shoulder like a regular set-in sleeve. The instructions to make this top only had 9 steps. Nine! It was so easy to put together. Here it is finished on Betsy, my duct tape dress mannequin. Betsy, as in Betsy McCall. Making her was a hoot and her total cost was $12! I’ll have to post about how she came to be some time. 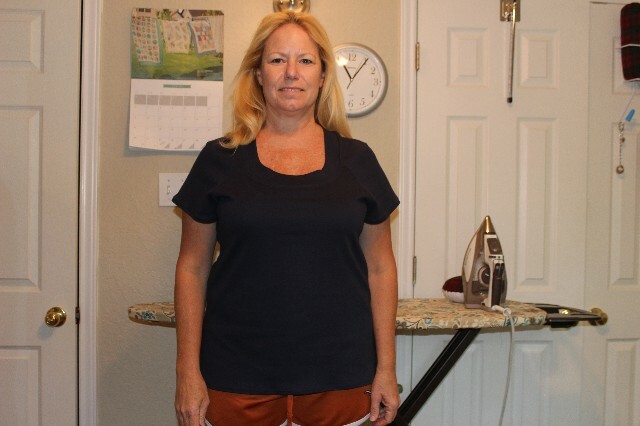 I topstitched the sleeves, hem, and neckline with a double needle. I see I’ve got some threads along the neckline I need to clean up. 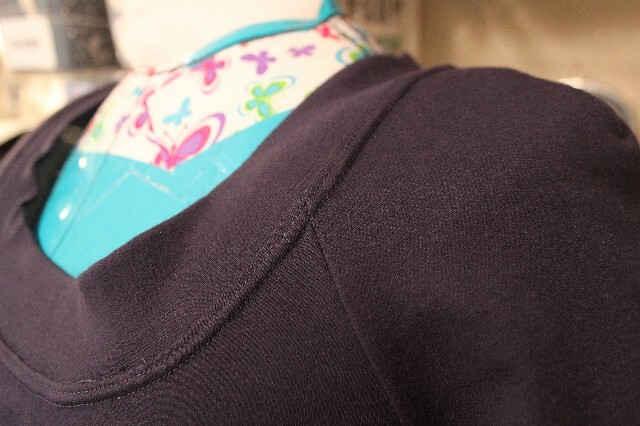 There’s a little wonky rippling there on the neckline too. Maybe it will lay down after it’s washed, but if I make this again, I’ll cut the neck band on the bias instead of the straight of grain like the pattern said. Truthfully, I should have seen that one coming. But it doesn’t bother me enough to take it apart and do it over. Here it is worn! And I’m on my tippy toes so you can see the length. That look on my face is me trying not to fall over! Ha! All ready for work tomorrow!